Did you know that your bones, fingernails, and tooth enamel, all keep a record of the radiation that you are exposed to? So does your hair and some items of clothing, like buttons. Your teeth do better than your fingernails and hair (which grow and fall off) and aren't as difficult to get to as your bones. So, physicist Prabhakar Misra from Howard University, is trying to get a grant to take samples of tooth enamel so that eventually he could have a record of the population's radiation exposure to compare with cancer rates. Now lets be clear - the photo on the right was created by shining a harmless, low-powered laser in an someones mouth. 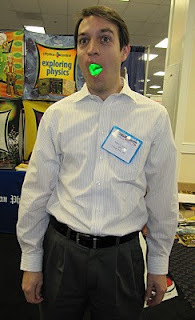 I used it as a joke - this person does not have radioactive teeth (he just loves lasers). And your teeth do NOT become radioactive when you are exposed to radiation. But they do hold a record of the amount of radiation you have been exposed to. Employees of companies and labs that use radioactive materials often wear dosimeters - devices for measuring the amount of radiation the wearer is exposed to. Your tooth enamel is like a natural dosimeter, acquiring minor changes to it's chemical structure when exposed to radiation. Note that your enamel holds an overall record of your radiation exposure - so you wouldn't be able to tell exactly when a large dose took place. Radiation is almost everywhere and like most things, it's completely harmless in moderation. Only extremely large doses pose a problem. Bananas are one of the foods we eat that are particularly high in radiation, yet banana eaters are not more likely to get cancer. There are areas of the Northwestern United States that have unusually high radiation levels from natural material deposits in the ground. But once again, citizens of this area are still far, far below what would be considered a toxic level of radiation. In fact, there are areas of India with 3x the naturally occurring radiation who are still far below toxic levels. Now, I did bring up cancer in the beginning, which is what most people are afraid of when they hear "radiation." And there should be more investigation into the rates of cancer among people with varying degrees of radiation exposure, but even when these studies have been done in the past, radiation is not a one way street to cancer. In low doses it's not that simple. Genetics and other environmental factors can change the effect that natural levels of radiation can have on a person, and once again, a banana eating Portlander could very well live his or her whole life as the picture of health. The message that most radiologists and radiation specialists want to get out (not to mention nuclear physicists), is that you must be exposed to tremendous amounts of radiation to have it be harmful. Still, a study of the kind proposed by Misra would provide a tremendous amount of information and insight. He noted that a study in Japan using this system showed that medical workers, who had tremendous medical care and thus underwent more X-rays than the average person, were actually receiving the highest doses of radiation in the sample population. For the same reason, war veterans were being exposed to higher radiation levels. It might be interesting to find out which groups in the US are exposed to the most radiation and why. Misra only needs to take a small bit of tooth enamel from the patient to get their radiation history - so there's no damage to the patent's teeth. Sadly, he can't seem to get funding for it. As to why, you'll have to ask Misra and the funding agencies he's applied to. He and his group are steadily improving the technology to measure the radiation amounts with greater precision, as well as ways to make the equipment more portable. Perhaps in a few years they'll find someone willing to invest.